ProTherm Grey Thermal Sheet is a spun bonded polyethylene geotextile based upon Tyvek® by DuPont that is waterproof and vapour permeable. 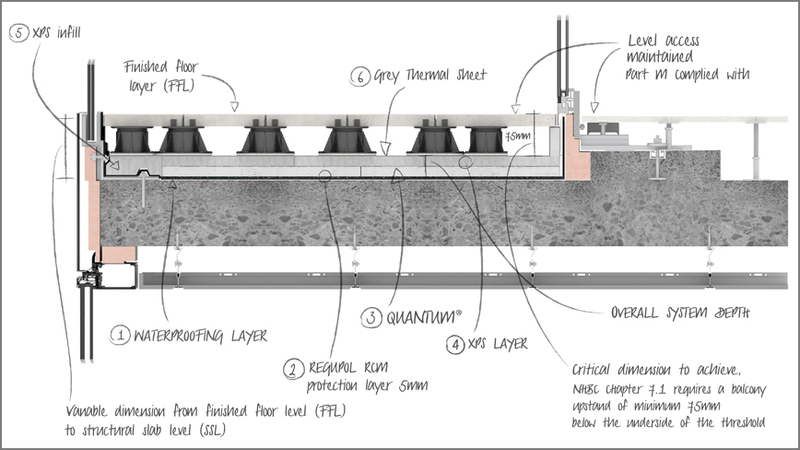 ProTherm Grey Thermal Sheet replaces the usual separating layer laid between the insulation and ballast, prevented water from reaching the waterproofing layer and almost completely eliminating the rainwater cooling effect. When installed with ProTherm Quantum inverted roof insulation in an inverted roof ProTherm Grey Thermal Sheet reduces the rainwater cooling, reducing the required insulation thickness by 2%. Available in 2 roll sizes, 300m2 and 150m2, ProTherm Grey Thermal sheet is for use with Inverted Roof Waterproofing such as PermaQuik PQ6100, EshaFlex, EshaUniversal and ParaFlex. Lay ProTherm Quantum inverted roof insulation boards. Loose-lay ProTherm Grey Thermal Sheet over the insulation, at right angles to the slope. Overlap next sheet over the previous by 150mm (laps running down the slope). If the depth of the aggregate ballast is to be kept to a maximum of 50mm deep then 300mm laps are required. At upstands and penetrations ProTherm Grey Thermal Sheet should be turned up to finish above the surface of the ballast.